Yesterday, Google announced they are making Google by default for signed in users, SSL. 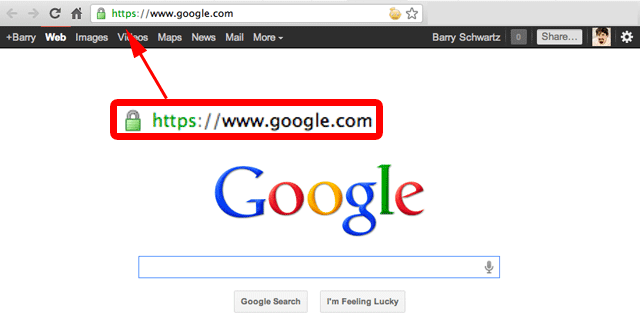 Meaning, if you are signed into Google and go to Google.com, the page will default to https versus http. Less Than 10% Of Google Searchers Are Signed In? Google says this will likely only impact less than 10% of the searchers. So in a sense, Google is saying that less than 10% of their users are signed in when performing Google searches? So yes, this makes your search query more secure. People searching on public wifi networks or who are afraid someone might sniff out their search query as they do it, can now breath with ease. Again, only if they are logged in. I assume this will be rolled out more broadly to everyone soon enough. But the reason only for signed in users now is because the results are more personalized for signed in users and thus the information is more specific to the user. In short, marketers and SEOs are not happy because they search queries will be lost with this. This is how SSL works, when you go from an HTTPS to an HTTP URL, the referrer data drops off. This data is critical for marketers. Knowing what people are searching for on Google that land on your site is mission critical information for marketers and for making better web sites. Yes, Google Analytics can be integrated with Google Webmaster Tools to get SEO reports in Google Analytics but that only shows you the top 1,000 search queries, aggregated, for a site for the past 30 days. It is not as comprehensive with the long tail as most marketers would want. Note: AdWords query data will be passed through despite the SSL because they are paying customers. I strongly recommend you read Danny's Google To Begin Encrypting Searches & Outbound Clicks By Default With SSL Search and a great piece by Matt McGee summarizing the blogsphere's reaction to this named Reactions From SEOs Come Loud, Fast & Often Angry To Google’s Switch To Encrypted Search. This has a lot of the other coverage, including, see the Techmeme roundup. So much for controlling access to our sites .... This means not just WHO but HOW. I'm sad for this update :( ... I feel that keyword data helps webmasters build a better Ux for their users by understanding what their visitors are looking for. Aren't there other ways of anonymizing users who want their data to be protected? Perhaps I'm missing something, but if this is about protecting users' privacy, Google should also be encrypting the referrer data from visitors coming from paid search. Must be about devaluing traffic from natural search and encouraging more people to use PPC. That will definitely change the ball game. Forum discussion at Sphinn, WebmasterWorld, Cre8asite Forums, JohnMu Google + and Google Webmaster Help.